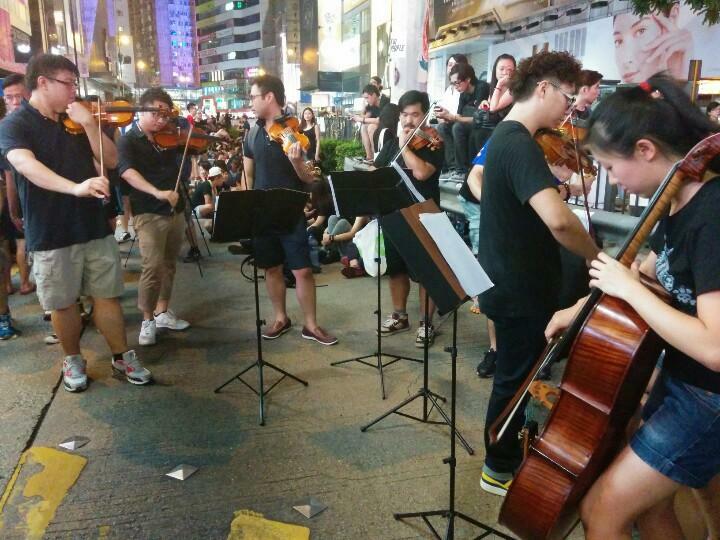 …unless you happen to be occupying Central, in which case you’re embroiled in the thick chaos of rebellion. For Aussies at least, China’s National Day holiday week offers a welcome respite from the daily torment inflicted on us by the Chinese commodities exchanges. So no iron ore or steel news today; for once this Straya T’day post will be all-Strayan. 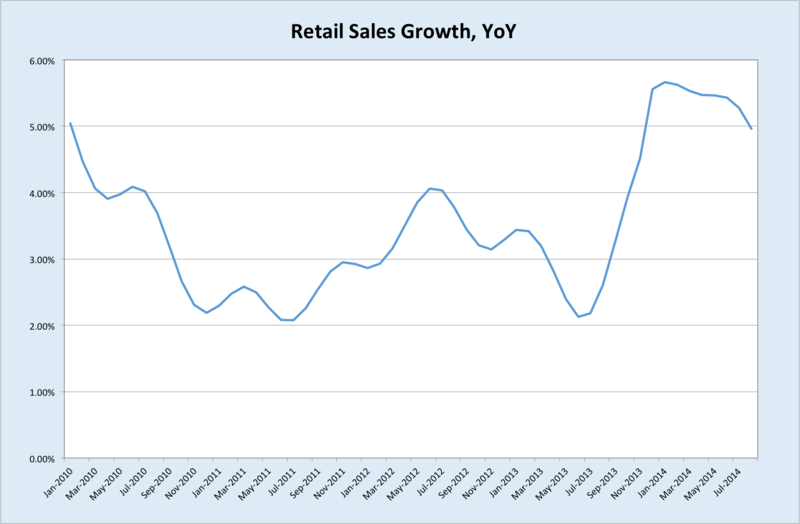 Retail sales for August came in lower than expected, printing a 0.1% seasonally-adjusted gain over July, on expectations of +0.4%. 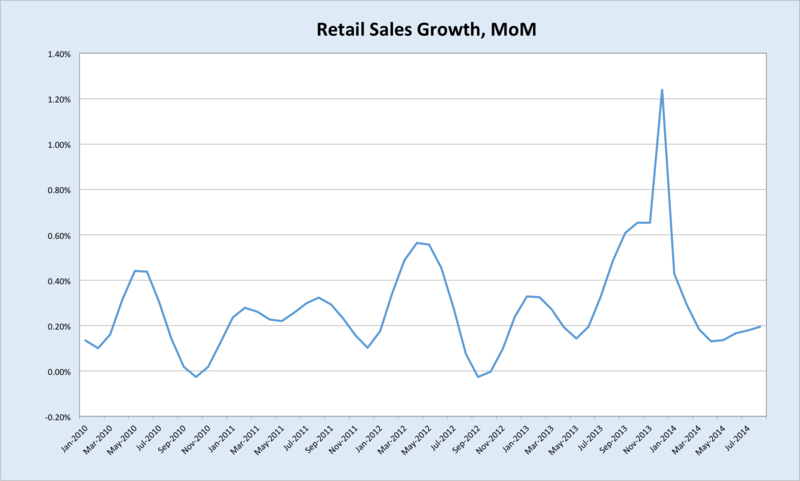 Retail turnover was 5.1% higher than August last year. The respective trend figures were +0.2% and +5%. However much of this strength reflects the surge in the latter half of last year, which is still ‘passing through the snake’. Monthly figures have been subdued for most of this year. The budget didn’t do much for consumer sentiment, and this has no doubt been a key factor in households’ reluctance to loosen the purse strings. 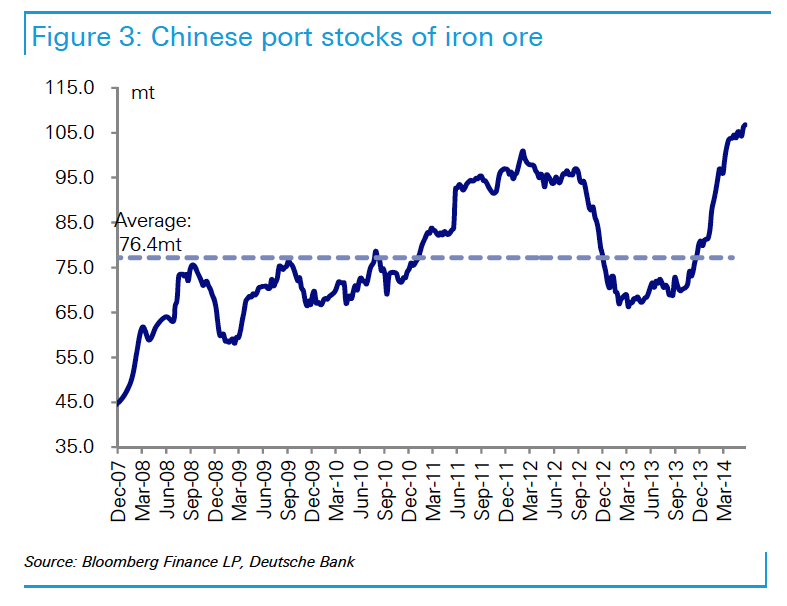 It may also be a function of the deteriorating outlook for iron ore, which has been reported more widely and with an increasing acceptance that the situation is not likely to improve materially in the foreseeable future, other than perhaps a tepid restock in Q4. In fairness, Australia’s manufacturing PMI surprises me with every release, since its very existence implies that manufacturing has survived another month. It’s pretty bleak reading, although that’s nothing out of the ordinary. Until Australia’s real exchange rate significantly devalues, there’s little hope of a broad-based revival in business expenditure in the manufacturing sector. 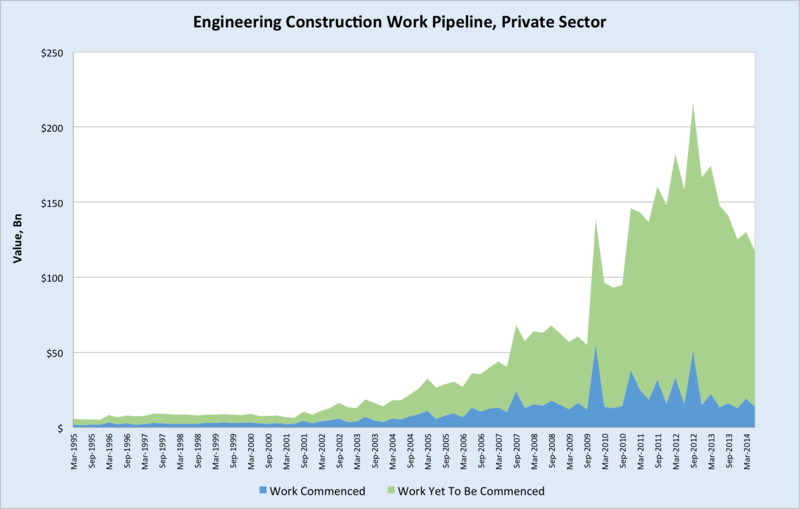 Along with retail sales, the ABS released quarterly data today on engineering construction work, which is an important measure of mining investment activity. Combined with the flagging terms of trade, the downturn in mining investment is the chief headwind facing the Australian economy over the next couple of years. 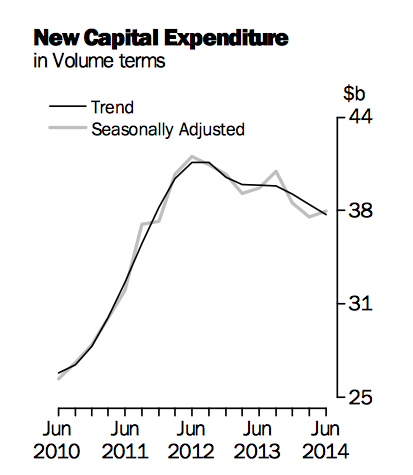 Overall, the value of work completed declined 2.2% in the June quarter from March. 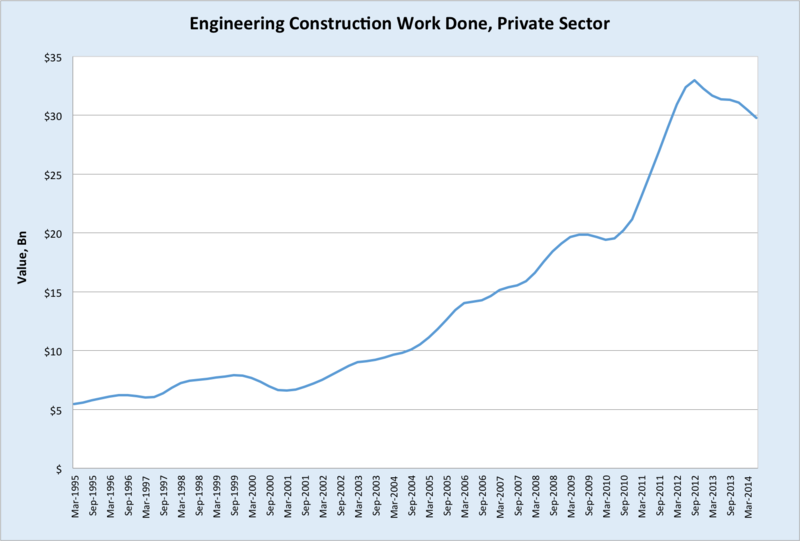 The value of work completed by the private sector declined 1.9% to $23,130m. So far the descent has been fairly smooth, however this is set to steepen rapidly over the next 6 to 12 months. 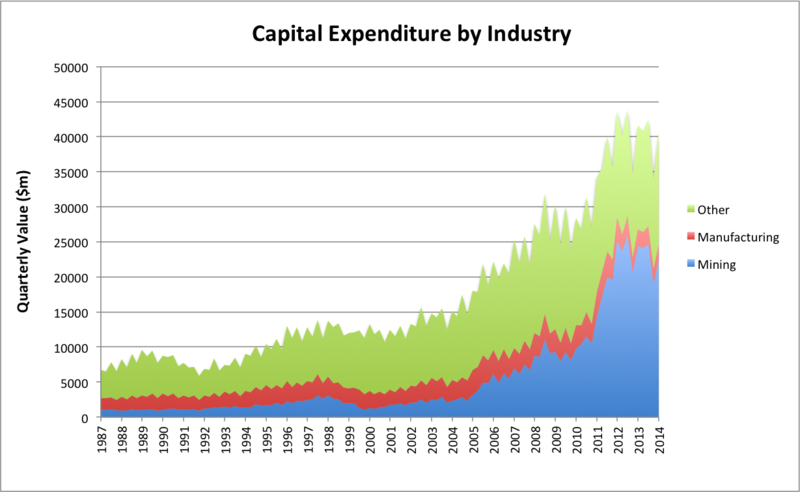 Of course, all this investment is going towards substantial increases in Australia’s export capacity, primarily in LNG. So will the decline in investment give way to a boom in exports, such that the net impact on the economy is benign? It’s important to remember that Australia’s mining boom over the last decade has been enriching beyond precedent because it was a boom in profits. So despite the vast majority of Australia’s mineral resources being owned by foreign interests, the profits generated by these firms greatly increased company tax receipts and royalties revenue, much of which was then passed on to households in the form of tax cuts and transfers. Booming profits also saw wages in these industries skyrocket, providing another conduit for the windfall to flow into the Australian economy. 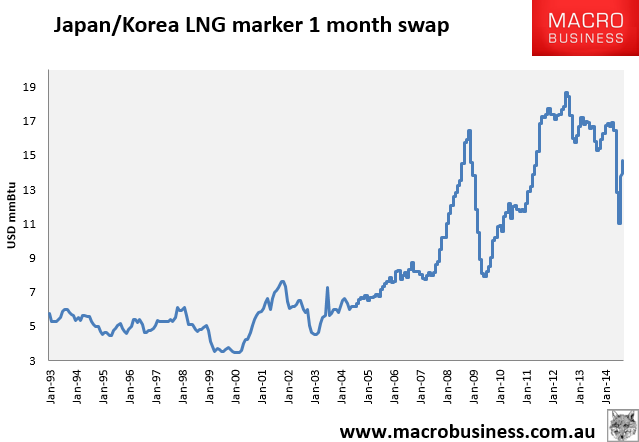 The ‘boom’ in LNG exports after the investment phase passes and supply ramps up will be quite different. These mega-projects in Queensland, WA and the NT are going to be about the most expensive sources of LNG on the planet, placing them at the other end of the ‘cost curve’ to Australia’s iron ore majors (see below). This means that current LNG prices aren’t going to deliver the massive profit margins that characterised the mining boom. So although Australia’s export volumes will surge, supporting GDP growth by improving the trade balance, the income effect on Australia will be negligible when compared to the iron ore and coal booms of the last decade. …and yet the ramp-up in Australia’s LNG exports has barely begun. If spot prices do fall significantly below contract prices, there will be immense pressure on suppliers to renegotiate those agreements. 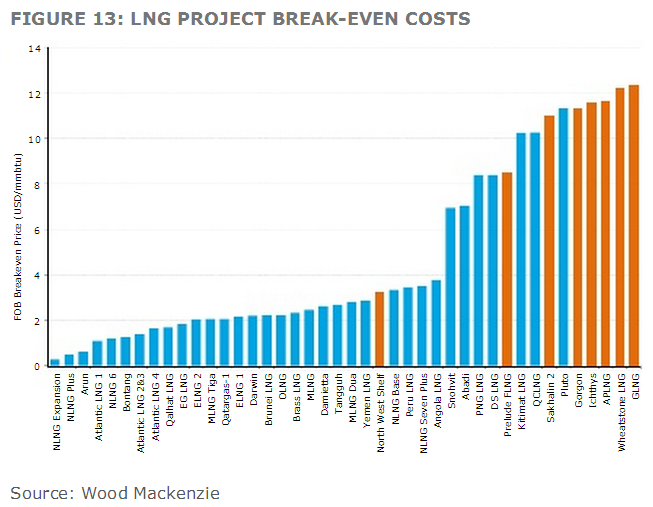 Here’s where Australia’s LNG projects sit on the cost curve (in orange). Clearly, if spot prices drop much below the levels they did during the northern summer, and stay there for any length of time, a lot of these projects are going to face serious trouble as buyers attempt to wriggle free of contractual obligations. 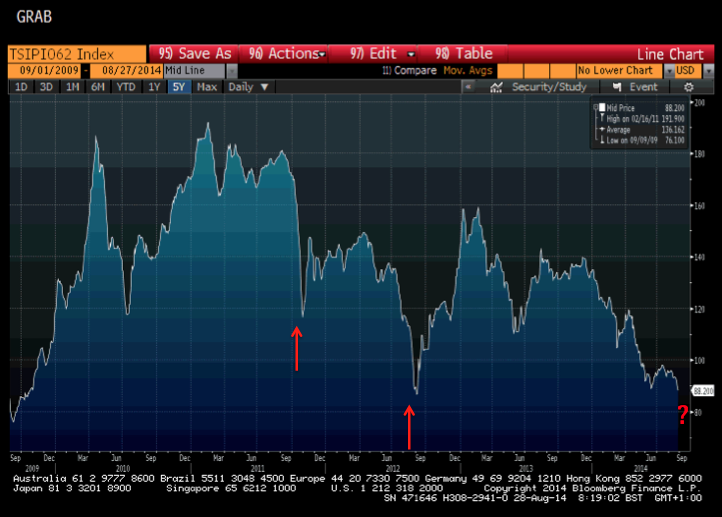 Yet another reason why we’re fervently cheering the Australian dollar lower! This entry was posted in Capex, LNG, mining and tagged Australia, capex, exchange rate, LNG, retail sales on October 1, 2014 by MJV.